Ladies and gentlemen, let’s help Bob Dylan usher in the Clinton era! Oh, what a wonderful fit. The election of America’s first baby boom president, the draft-dodging, pot-not-inhaling policy wonk from Arkansas and the mercurial legend from Minnesota. Clinton’s first inauguration, January 20, 1993, featured a veritable who’s who from the 1960s (Bill’s people) and the 1990s (to prove that he was with it): Aretha Franklin, Tony Bennett, Diana Ross, and, um, Michael Bolton, and, er, LL Cool J. Look, maybe we can blame the transition team for a couple of those names. Or Chelsea. 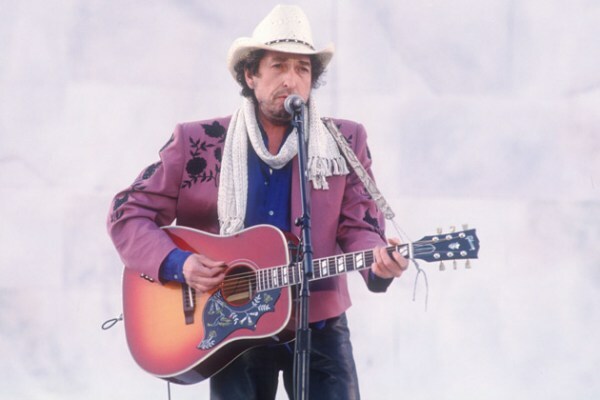 Dylan did one song at the inauguration celebration on the mall, “Chimes of Freedom”. His performance, which you can see in full above, raises a few distinct questions, not the least of which is: Where can I get one of those jackets? That thing is incredible. The video is goofy as hell. Clinton himself jumps around in his seat with an air of excited glee when Dylan comes out, sort of pretending to be surprised. Every time the camera shows the Clintons and Gores you are struck by how phoney the whole thing is – they have to play the role of audience for this show because they know that they may be on camera at any moment. Clinton does a terrible job of it, frankly. Dylan isn’t doing such a great job either. First, even though “Chimes of Freedom” may in fact be the fastest rising song in my estimation this year (going from a song I cared little about, to one that I think is close to the best thing he ever wrote), it is a somewhat odd choice for such an occasion, because it is elliptical and not entirely on point. But it sounds upbeat, particularly if Dylan garbles the lyrics. And garble he does! I can’t even imagine what this would have sounded like at the back of the mall with 100,000 people and tinny speakers. I watched it four times this morning with the lyrics open in front of me and I still struggled to make out what he was saying. For the record, “Chimes of Freedom” is a six verse song. 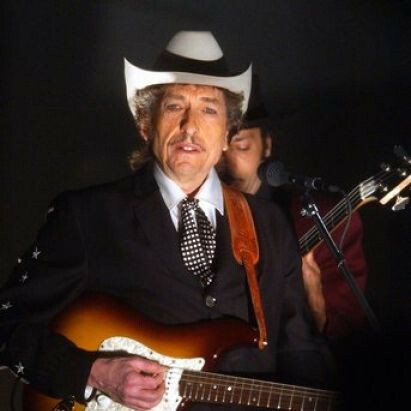 Dylan comes out and sings the first verse, half of the second combined with half of the third, half of the fourth combined with half of the second, and then the sixth. It is a mystery. I’m not sure you could really fully say you understand anything other than the title of the song. Regardless, here we have Dylan donning the mantle of voice of a generation for the first time in a quarter century, as his generation takes its place at the centre of the universe. The last time Dylan sang from that location he was in the company of Martin Luther King, Jr., and now here he was singing for a president who in three years would sign into law a welfare reform that King would have fought with all of his might. 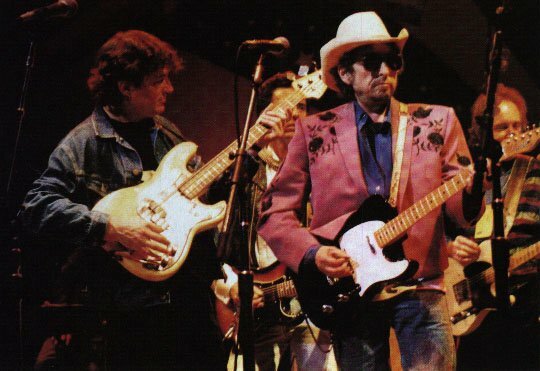 Dylan also performed at the Arkansas party later that night. He did “To Be Alone With You” backed by Steven Stills and The Band. I don’t have video for that one, but here is a picture.